This article was originally supposed to examine the economic and social implications of the newly elected government in Ireland. But as I will discuss, this has been left uncertain still..
As those who have been paying attention to the2016 Irish General Election over the weekend should know, the result have shown a relatively mixed bag in term of viable coalitions. The two big winners were of course Fine Gael and Fianna Fail, the main contenders in the Irish political landscape of the 20th Century. Although it may have come as a shock to many how quickly the Irish people jumped back to their family favourite party following the Fianna Fail exodus that occurred after the Irish Economic Crisis. 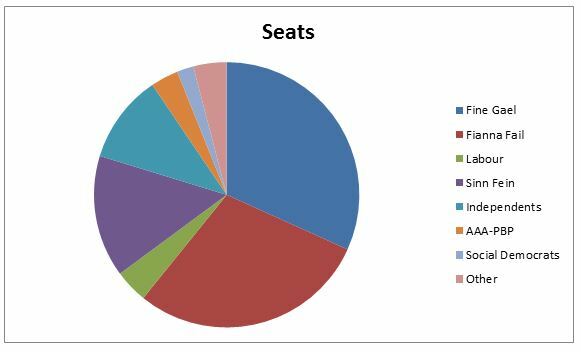 Although the counting has not ceased yet, it is interesting to consider the possible dynamics of the various possible coalition that this election may produce. With voters rejecting the former coalition of Fine Gael & Labour by drastically reducing support for the Labour Party there may be no choice but to go ahead either with a rainbow coalition or see the two civil war rivals collaborate to form a government. A recent poll in The Journal (an Irish online publication) when asking what would be the preferred coalition option, the number one answer was to call another election followed by a FG/FF coalition. This shows a strange resentment for cooperation of these parties by the people despite the two parties being the most ideologically similar in the Irish political system. The question so far is this: would these two historical rivals even be able to work together for the good of the Irish people? If so, would they even be able to elect a single leader? It’s hard to say. In fact I believe it is hard to see a working government with a single vision rise from this election. With the new parliament scheduled to meet again on 10th March, I am not alone in believing that this Dail will most likely not be able to elect a Taoiseach.